« Go-today Holiday Season Sale Features Dublin Escape Package from $799 if Booked by Dec 31. Crested Butte Mountain Resort (CBMR) has just opened the Coke Zero® Gravity BagJump as its latest amenity in the Adventure Park. The 50 feet by 50 feet by 11 feet deep bag is filled with air and acts as a safe and cushioned landing pad for jumpers, tubers, skiers and snowboarders. 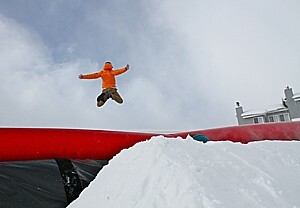 Always looking to create a more innovative and unique experience for guests, Crested Butte Mountain Resort (CBMR) has just opened the Coke Zero® Gravity BagJump as its latest amenity in the Adventure Park. The 50 feet by 50 feet by 11 feet deep bag is filled with air and acts as a safe and cushioned landing pad for jumpers, tubers, skiers and snowboarders. BagJump™ is a versatile product that can be used all year round, from beginners to professionals, for Olympic level training or just for recreation; giving the feeling of “landing on a cloud” when jumping into it. In Crested Butte, the BagJump will act as a place for kids and adults to sled into on a tube and for skiers and snowboarders to test their freestyle skills. In the summer months, adrenaline seekers can free fall into the bag off an elevated platform. The BagJump is part of the Adventure Park ticket for unlimited use and available for Platinum Season Passholders. The BagJump is now open daily from 1 – 5 p.m.
Skiers and riders will be required to go through a safety course to receive a stamp of approval in order to utilize the BagJump on their skis and boards. This entry was posted on December 29, 2012 at 9:37 pm and is filed under Colorado, Ski Colorado, ski resorts, skiing, snowboarding. You can follow any responses to this entry through the RSS 2.0 feed. You can leave a response, or trackback from your own site.